We’re looking for photos of your installation whether you are a professional installer or weekend DIYer. The photos should be clear and well lit. Professional-quality photography is preferred and given first consideration. In your initial email provide a brief explanation about what makes your theater special. If we choose your submission, further details will be required that will focus on the key highlights and features of your theater. We really like to hear of any challenges you encountered and how you overcame them. We like to see a couple of “before” shots, only if you did major construction that really transformed your environment. 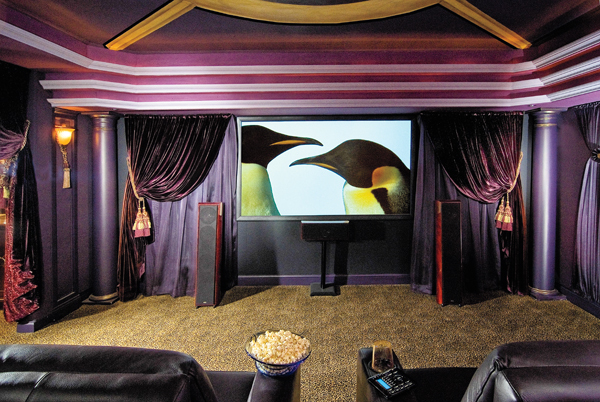 Otherwise, only send images of the completed theater room. Close-ups of the equipment racks (watch for glare when photographing), front and back, are also welcome. Each photo should be in the jpeg format [xxxx.jpg], sized between 600-1000 pixels wide. Please do not send the original high resolution files (but have them available upon request). Please indicate if you are a pro installer or a DIY reader when making the submission. Also, if you are the homeowner contacting us, but your theater was professionally installed, let us know who the installer was in your initial submission.